To solve the problem of fitting fish farms into the same policy as land-based farms, federal regulators are simply rewriting the rules. The NOP - with help from the National Organic Standards Board, or NOSB, and its own Aquaculture Working Group - is now developing a set of guidelines that specifically address aquaculture. They would allow up to 25 percent conventionally grown material - specifically fishmeal - in the diets of farmed fish certified as organic. The plan would be to slowly scale this amount down over the years, though critics say they doubt this process would occur. With other certified organic meats, the animals must be fed completely organic feed. But according to this proposal, fish could be fed up to 25 percent conventionally grown material--in other words, non-organic--which is a major reduction in the strictness of the organic guidelines. And the only guideline for exactly what that feed would be made of is a word without the weight of regulation behind it: "sustainable." Unlike "organic," the word "sustainable" is totally unregulated and therefore meaningless--if anyone can call themselves sustainable, what's the point? The biggest problem here is the further watering down of the organic standard. Organic is already a term with a much bigger umbrella than you might think; organic products are not necessarily any healthier for you than conventional products, the farms are sometimes monoculture (meaning, growing or raising a single product, which can deplete the environment of certain nutrients without allowing it to recover), and the rules allow animals under two days old to be injected with antibiotics. But! Organic certification is the best regulation we have at the moment. And it's not all bad! Organic-certified animals have to be fed organic food, like corn or wheat, without synthetic additives. They cannot be given hormones or antibiotics or other drugs after that two-day mark (conventional farming's antibiotics are a major problem in the rise of resistant bacteria). They must be given room outside to move around. And it has benefits! In a recent study at Stanford, organic dairy was found to be higher in beneficial fatty acids than conventional dairy, and had far lower levels of antibiotic-resistant bacteria. Organic isn't perfect, but we need to be striving to make organic certification and food regulation as a whole even more stringent, not less. It's good for us, it's good for animals (at least, better for animals), and it's great for our relationship with animals. Improving these rules, in which an animal raised for meat or milk or other product is given as much respect as we can possibly give it, is essential for us to value animals and not take their lives for granted. 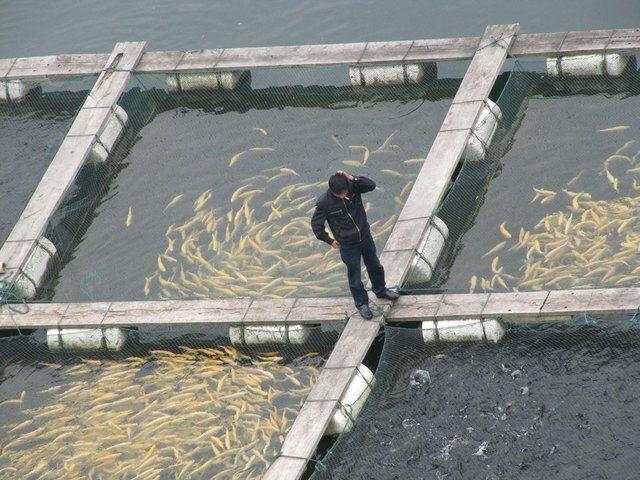 Watering down the rules for aquaculture--pun intended, sadly, sorry--is exactly the wrong move. It'll do nothing but assuage our guilt--and if people learn what's actually going on, it won't even do that.